This new image from NASA’s Mars Reconnaissance Orbiter shows dark streaks on the walls of Garni Crater on Mars. 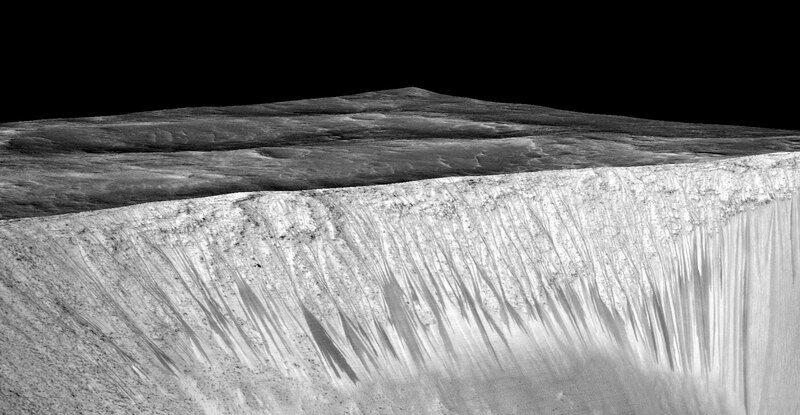 Astronomers believe these recurring streaks are formed by flow of briny liquid water on Mars. Dark narrow streaks, called “recurring slope lineae,” emanate from the walls of Garni Crater on Mars, in this view constructed from observations by the High Resolution Imaging Science Experiment (HiRISE) camera on NASA’s Mars Reconnaissance Orbiter. The dark streaks here are up to few hundred yards, or meters, long. They are hypothesized to be formed by flow of briny liquid water on Mars. The image was produced by first creating a 3-D computer model (a digital terrain map) of the area based on stereo information from two HiRISE observations, and then draping an image over the land-shape model. The vertical dimension is exaggerated by a factor of 1.5 compared to horizontal dimensions. The draped image is a red waveband (monochrome) product from HiRISE observation ESP_031059_1685, taken on March 12, 2013 at 11.5 degrees south latitude, 290.3 degrees east longitude. Other image products from this observation are at http://hirise.lpl.arizona.edu/ESP_031059_1685. 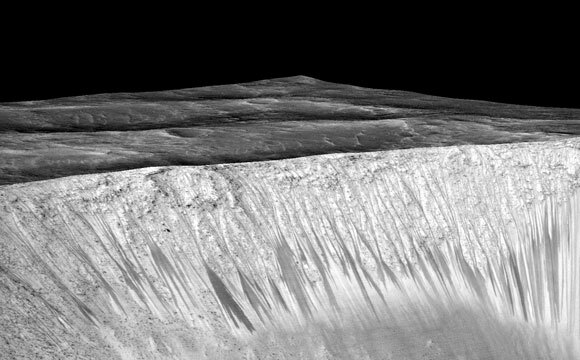 Be the first to comment on "Mars Reconnaissance Orbiter Reveals Recurring Water Streaks on Mars"